Andy Ashcraft still doesn’t look like a guy with malignant pleural mesothelioma, and especially not one who was diagnosed with the deadly cancer six years ago. He remains an anomaly, a beacon of hope and a testament to cannabis oil, a positive attitude and a belief in God. As word spreads through the mesothelioma community, Ashcraft is receiving more and more inquiries about his cannabis oil treatment, most asking to share his not-so-secret secret to fighting off the cancer. Although an immunotherapy clinical trial worked well for almost three years, its effectiveness stopped suddenly and his health plummeted quickly. His doctor suggested palliative care and a hospice facility for his final weeks as the tumors grew. At the insistence of Ruth, though, he instead turned to cannabis oil, a derivative of the marijuana plant, sparking a miraculous recovery. Andy and Ruth will be participating in the American Cancer Society’s Relay for Life on May 14 in Murrieta, California, spreading the word under the banner of Strollin’ for a Cure. Disclaimer: Asbestos.com is not a medical facility and does not provide medical advice. The following content is from the wife of a mesothelioma survivor who uses cannabis oil as his cancer treatment. The use of medical marijuana and its derivatives may be illegal in your state. Contact your state representatives to confirm whether medical marijuana is legal. Asbestos.com does not condone or promote the use of cannabis oil for the treatment of mesothelioma. You should consult your doctor before using cannabis oil or any form of complementary and alternative medicine. Because of the number of requests Andy and I are getting about his survival, we wanted to share with everyone a few of the things Andy is doing to help him stay healthy. It’s our hope to help anyone suffering from this horrible disease. I’ll preface it by saying we cannot guarantee this will work for anyone else. We are not stating it’s a cure, by any means. We are not experts and have no medical background. We are only sharing what has been working for Andy with the hope it may help someone else. You should talk with your own doctor first to get his or her medical opinion before trying any alternative medicine. Also, this might not be available where you live, and I’ll warn you, it’s not cheap. Andy has been completely off chemotherapy since July 2014. He has been living a happy, active life now like any normal 69-year-old man. We spend a lot of time traveling to our grandson’s games, visiting friends and family. We exercise every day. We attended his 50th class reunion last October. If you met Andy, you would never know he was given a very grim diagnosis of stage IV mesothelioma in May 2010. We both feel that in order to fight this disease, it is mandatory to keep a positive attitude and faith in God. We think the cannabis protocol has helped, too. The use of cannabis oil derived from medical marijuana is not legal in every state. Because California legalized medical marijuana in 1996, one of the first things we did was obtain a medical marijuana identification card (MMIC). These cards identify the holder as being legally able to possess medical marijuana for a serious medical condition such as cancer. Before obtaining the MMIC, you must first consult your doctor. The doctor’s diagnosis and recommendation that cannabis oil is appropriate and safe must be documented before the local public health department issues the MMIC. The costs vary by county, but ours cost $50. How is the oil you sell extracted? Andy will not ingest cannabis oil extracted using butane or naphtha because those are dangerous chemicals. He prefers oil extracted with 100 percent grain alcohol or carbon dioxide. I’d like to see the results of extraction. This should show you how the oil was extracted and the amounts of the cannabinoids: CBD, THC, CBN, CBC, CBL and a few others. What we paid most attention to were CBD (compound with medical benefits and no mind-altering ability) vs. THC (primary ingredient that alters senses). I always try to get Andy oil with the highest amount of CBD and some THC. Medical research shows CBD helps fight a myriad of issues for all types of cancer and other diseases. If the dispensary you’ve chosen can answer these questions, you are satisfied with the test results and decide to start using cannabis oil, you’re ready for the next steps. It’s important to start slowly. If it’s well-tolerated, then you can increase the dosage until you reach the suggested amount to keep the tumors at bay. Andy eventually reached about 1 gram a day, which was right for him. The cost for this treatment in our area is about $1,000 a month. The oil can be put under the tongue, although Andy says it’s not palatable. I use clear veggie caps that can be purchased in any health food store. We have a mobile dispensary, and our guy is knowledgeable, especially when it comes to different ways of ingesting the cannabis oil such as cookies, brownies, candy bars and other items. The only downside to those items: They’re made with the actual plant, which contains high levels of THC and can get you intoxicated. Also, there is no way to track just how much cannabis is in each item. We do purchase some brownies, but they usually are just a snack for Andy at night when we know we are not going to leave the house again that day. I believe it helps him sleep. Andy takes mostly honey oil capsules with high CBD. 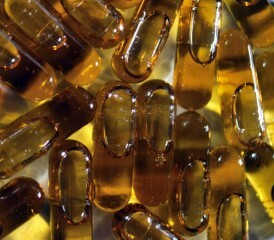 These resemble the light yellow, transparent vitamin E capsules. Andy takes a total of four capsules each day. I give him a honey oil capsule before or with every meal, and I prepare a final veggie capsule for him before bed. I hope this answers some questions regarding Andy’s use of cannabis oil. I feel that information is power, and God knows we need all the power we can muster to fight this disease.